Try this tonight if you want to help your acne go away! Spring has sprung (sort of!) and with that renewal, our skin also needs some assistance as it begins to get used to the different climate. New issues may arise or not, however, adding a new revitalizing mask to your skincare regimen can be a simple and effective way to help you in your journey to treat acne. Please note that this mask WILL NOT TREAT your acne (you need a TREATMENT to do this) so do not use it as a replacement for a treatment. It will however provide you with another highly effective skincare tip as you're on your way to an acne-free life. Egg has been used in many cultures and traditions as a symbol of renewal, spring and new life. The egg white reduces excess sebum by shrinking the pores. It will also give your skin a firmer and more even look by greatly reducing larger pores. Lemon brightens and exfoliates. It is a natural source of vitamin C and rich in alpha hydroxy acids. Many of our AcnEase® users use this spring mask around this time of year with great results. So if you're looking for a bit of help before the holiday weekend, here it is. - If your skin is VERY dry and sensitive, you may add ½ teaspoon of organic olive oil to the mixture. - If you have open cysts on your face, you may want to wait to try this until the cysts are closed and dried up (don't want the lemon juice to sting - this should be an enjoyable experience, not a painful one!). - If you want to use this on other acne effected areas other than your face, you can certainly do so, but just beware of sensitive areas (eyes, mouth, etc). Beat the egg white first until it turns a bit frothy. Add the lemon juice to your egg white. Apply the face mask on your face with your fingers (make sure your hands are washed), avoiding the eyes and mouth area where the skin is dryer and more sensitive. Leave your face mask on your skin for about 20 minutes. 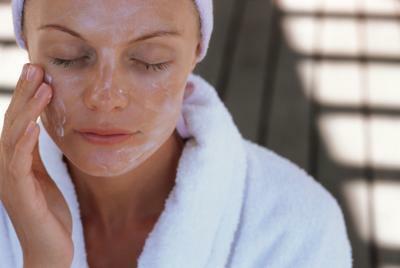 Gently rinse it off with warm water; pat dry and apply a non comedogenic moisturizer. You can do this 1-2 times per week, however, if you are doing an exfoliating mask during the week, do this once per week (and don't do it on the same day that you do the exfoliating mask). Let us know how this works for you. Happy Spring!